Charged particles passing the detector not only create ionized but also excited Argon molecular states, which produce scintillation radiation through recombination and de-excitation processes. Scintillation light emission ( λ=128nm, VUV region ) is detected immediately (less than 2 microseconds) by photo-multipliers (PMTs) immersed in Liquid Argon. Thanks to this it is provided an absolute time measurement (t0) and trigger for ionizing events occurring in Liquid Argon. 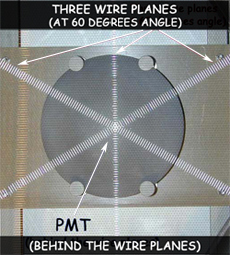 The photomultipliers are placed behind the wire planes and their glass windows are coated with a proper fluorescent wavelength shifter (TetraPhenyl-Butadiene).